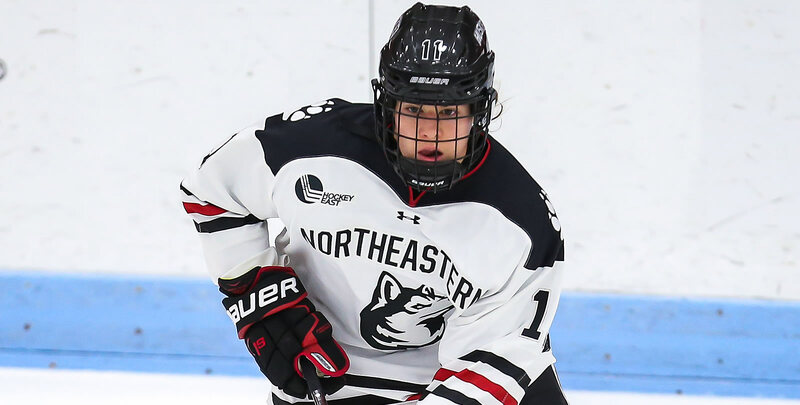 Northeastern swept UConn in a two-game series that saw freshman forward Alina Mueller (Winterthur, Switzerland) push her point streak to an NCAA-best 22 straight games (14g, 21a). Mueller also won 21 of 31 faceoffs on the weekend. Aerin Frankel (Briarcliff Manor, N.Y.) won both games she started over the weekend, improving to 11-0-0 against Women's Hockey East opponents this season. Boston University took a pair of wins over Holy Cross, improving to 10-5-4 in league play and moving into third place in the Army ROTC Hockey East Standings. Jesse Compher (Northbrook, Ill.) scored a goal in Friday's 4-1 road win before dishing out a pair of assists in the Terriers' 7-1 victory on Saturday against the Crusaders. Compher leads the league with 40 points and the entire country with 27 assists. Boston College traveled to Vermont, sweeping the Catamounts in the two-game road set. Jillian Fey (Nantucket, Mass.) scored her first career goal on Friday before picking up her first assist on Saturday's game-winning strike. Megan Keller (Farmington Hills, Mich.) also netted two goals in the Eagles' two-win weekend, including Friday's game-winning strike. She currently leads all NCAA blueliners in goals (13), points (29), and points per game (1.21). Merrimack took four league points from Maine in home stand, improving to 10-7-0 in WHEA play on the season. Sam Ridgewell (Outlook, Sask.) stopped 61 shots and allowed just one goal to the Black Bears. Her 30-save shutout on Friday was her sixth of the season. 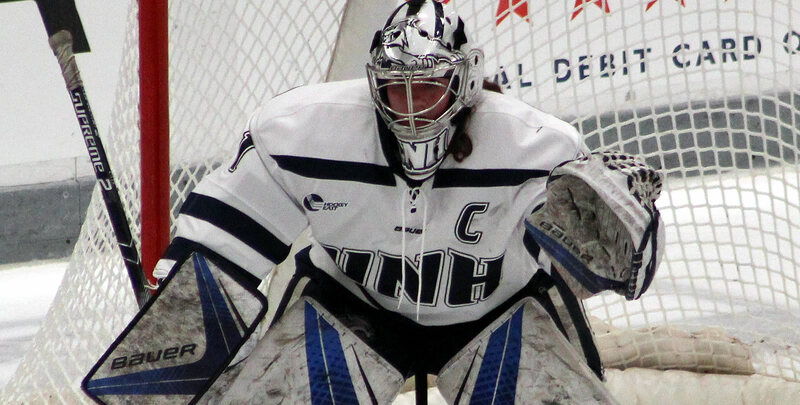 New Hampshire and #9 Providence split their weekend series, trading a pair of shutouts. Madison Myers (Colchester, Vt.) pitched a 29-save shutout in Friday's 4-0 win, while Kyra Smith (Littleton, Colo.) kicked out a career-high 41 in a 5-0 blanking of the Friars. Alina Mueller (Fr., F; Winterthur, Switzerland) tied for the league lead among rookies with four points (1g, 3a) as the Huskies swept UConn, 5-2 and 4-1. The rookie netted the game-winning goal and two assists on Friday and picked up another helper on Saturday, pushing her point streak to an NCAA-best 22 straight games. Mueller also won 21 of 31 faceoffs on the weekend. Courtney Correia (Fr., F; Whitby, Ont.) tied for the league lead with two goals and four points as she helped the Terriers to a twogame sweep of Holy Cross last weekend. After lighting the lamp on Friday, Correia collected a career-high three points on Saturday thanks to a highlight-reel goal and two assists. No other freshman in the country had more points this week than Correia. Kyra Smith (Sr., G; Littleton, Colo.) split a weekend on the road at #9 Providence, securing a win in game two with a career-high 41-save shutout on Saturday against a Friars offense averaging over three goals per game. She stopped 69 shots on the weekend total, finishing with a .958 save percentage and 1.53 goals against average. Saturday was her second blank sheet of the season and fourth of her career, as well as her second win over a ranked opponent this season. 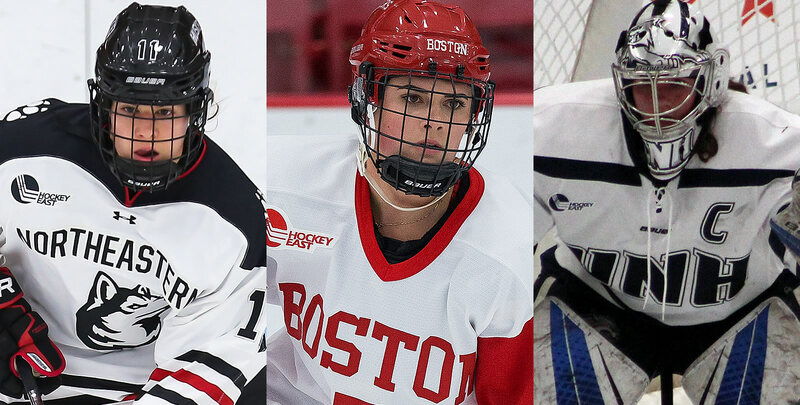 Caitrin Lonergan, BC (Jr., F; Roslindale, Mass.) Enjoyed a four-point weekend (2g, 2a) in a two-game sweep at Vermont, including a three-point night on Saturday. The junior set up the game-winning goal on Friday, then went for two goals and one helper in Sa turday's victory. She ended the weekend as a plus-four. Jillian Fey, BC (Fr., D; Nantucket, Mass.) Scored her first career goal in BC's win at Vermont on Friday, finishing as a plus-two rating and two shots on goal, before picking up an assist on Saturday's game-winning strike. She wrapped the weekend as a plus-four with two points (1g, 1a) and three blocked shots. Megan Keller, BC (Sr., D; Farmington Hills, Mich.) Netted two goals in the Eagles' two-win weekend at Vermont, including Friday's game-winning strike. Her tally on Saturday pushed her point streak to five games (4g, 3a). She tied for the national lead among defensemen with a plus-six on the weekend and fired nine shots on net and blocked one shot. She currently leads all NCAA blueliners in goals (13), points (29), and points per game (1.21). 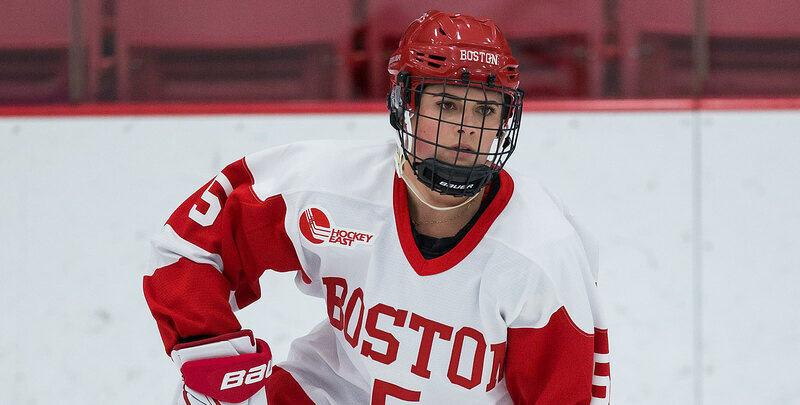 Jesse Compher, BU (So., F; Northbrook, Ill.) Scored a goal in Friday's 4-1 win a t Holy Cross before dishing out a pair of assists in the Terriers' 7-1 victory on Saturday against the Crusaders. Compher leads the league with 40 points and the entire country with 2 7 assists. Corinne Schroeder, BU (So., G; Elm Creek, Man.) Schroeder allowed just one power-play goal this weekend in two periods of work, making 18 saves on Saturday in an eventual 7-1 win over Holy Cr oss. Sam Ridgewell, MC (Sr., G; Outlook, Sask.) Stopped 61 of 62 shots she faced from Maine this weekend, picking up a pair of wins and her sixth shutout of the season in the process. Katelyn Rae, MC (Sr., F; Courtice, Ont.) Posted three points (2g, 1a) in a two -win weekend for Merrimack, including two goals and the game-winning strike in Friday's 3-1 win over the Black Bears. Taylor Wenczkowski, UNH (Jr., F; Rochester, N.H.) Potted two of New Hampshire's five goals in a 5-0 win over #9 Providence on Saturday. Her second tally came shorthanded with an empty net to secure the win for the Wildcats. Aerin Frankel, NU (So., G; Briarcliff Manor, N.Y.) Won both games she started over the weekend, improving to 11-0-0 against Women's Hockey East opponents this season. She stopped 46 of the 49 shots she faced from UConn, picking up a .939 save percentage and 1.50 goals against average. Saana Valkama, UVM (Sr., F; Pirkkala, Finland) Posted three points (1g, 2a) in a two-game set against #10 Boston College over the weekend, helping to power the Catamounts' offense.